Wrecking bar built from premium quality steel. Multipurpose bar is ideal for removing nails an pry boards, as well as generally breaking things. Curved end with flattened points uses small slots for easy nail-removal. Steel wrecking bar is durable for long-term use. 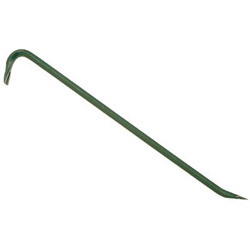 Type: Wrecking/Pry; Material(s): Heat Treated Carbon Steel; Head Width: 3/4"; Handle Type: Hex. Wrecking Bars from Jackson Professional Tools! 93 In Stock today.